NEW YORK CITY — January 13, 2019 — The Apex Flow-Thru™ 10,000 Order Pick-Up Solution is eliminating the long lines, confusion and operational issues associated with order pick-up. The two-sided design of the new self-serve, automated locker allows employees to load orders from the rear while busy customers pick up their orders from the front in just seconds. 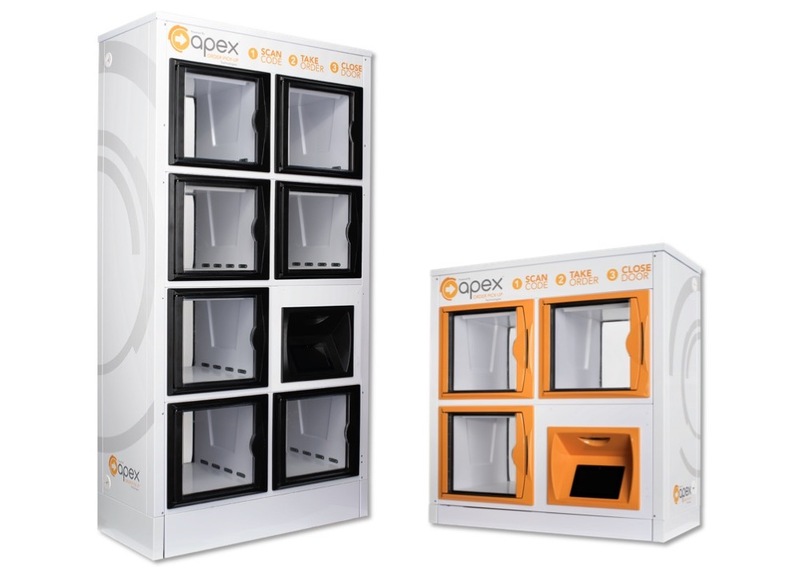 The game-changing device from Apex Supply Chain Technologies® is on display in booth 1946 at the National Retail Federation’s annual BIG Show through January 15th. Ensures order security and privacy. As finished orders are placed in a locker compartment, a notification is automatically triggered to alert the customer and give them a unique code. Upon arrival, customers skip the line and go to the Apex Flow-Thru 10,000 to input their code. Their secure compartment lights up and opens automatically. After grabbing their order, the customer can leave without waiting in line. This fast and simple process takes less than 10 seconds—no lines, no waiting, and no hassles for customers or employees. The Apex Flow-Thru 10,000 integrates easily with a brand’s existing infrastructure – including point of sale (POS), ERP, kitchen display systems (KDS), self-serve order kiosks and mobile apps. Employee training is simple and intuitive. The flexible, modular design ensures it’s available in countertop, floor and built-in configurations. This makes it easy, fast and affordable to rollout a chain-wide solution that is custom-fit to each location. Apex Supply Chain Technologies is the world’s leading provider of self-serve automated solutions for use in a variety of industries and applications. Discover how Apex helps retailers, restaurants and foodservice brands during the NRF Show at booth 1946 or online. And to follow our show coverage, look for #NRF2019 across LinkedIn and Twitter.